Janome 7360 is a an absolute bang for the buck machine. It would have been perfect if it had a slightly more powerful motor. CLICK HERE to read what other buyers say about Janome 7360. 7360 is the most advanced machine in the Magnolia series (also the most expensive). 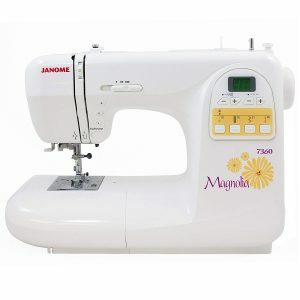 Magnolia 7360 has 60 built-in stitches on-board, which includes 7 one-step buttonholes as well. Normally you expect a machine of this price to feature a top drop-in bobbin with clear cover, and it doesn’t disappoint. The automatic thread tension control ensures consistent stitch quality across different types of fabrics. The automatic needle threader makes threading the needle effortless (this is not a huge surprise, you get this even on $80 machines). It also has a snap-on type presser feet, which means you don’t need to run for the screwdriver every time you need to change the feet. Memorized needle up/down is probably the most important feature on Janome 7360. This is a must have feature for quilters. 7360 is a machine targeted at quilters, so you expect this anyway. Memorized needle up/down is handy while pivoting around corners. The backlit LED screen is pretty basic (and small). It is not an advanced screen that you get on a Brother SE400 or other Brother machines. Easy navigation keys are provided for quick stitch selection. The buttons to adjust stitch width and length are provided right next to the screen. The maximum stitch width is 7mm and stitch length is 5mm. Most of the expensive Janome machines now come with 7 piece feed dogs which ensure consistent stitch quality and 7360 is no exception. Sewing start/stop button and speed control slider is the main feature that differentiates a computerized machine from a mechanical one. With the speed control slider, you are in full control of the sewing speed. You can go super fast or super slow according to your requirements. Slow speeds work the best for beginners (even though beginners may not require a sewing machine as expensive as this. Janome 7330 might just be enough for them, which costs around $200 less). Janome 7360 is free arm convertible and there is an option to drop the feed dogs, just in case you want to do some free-motion quilting. Separate buttons are provided for locking stitch and reverse sewing. Auto-declutch bobbin winder prevents over filling. The extra clearance provided by the extra-high presser foot lifter is really handy while working with multiple layers of fabrics. Retractable carrying handle adds to the portability. The machine weighs 16.45 pounds, which is a clear indication that most parts are made of metal, which is good for durability. 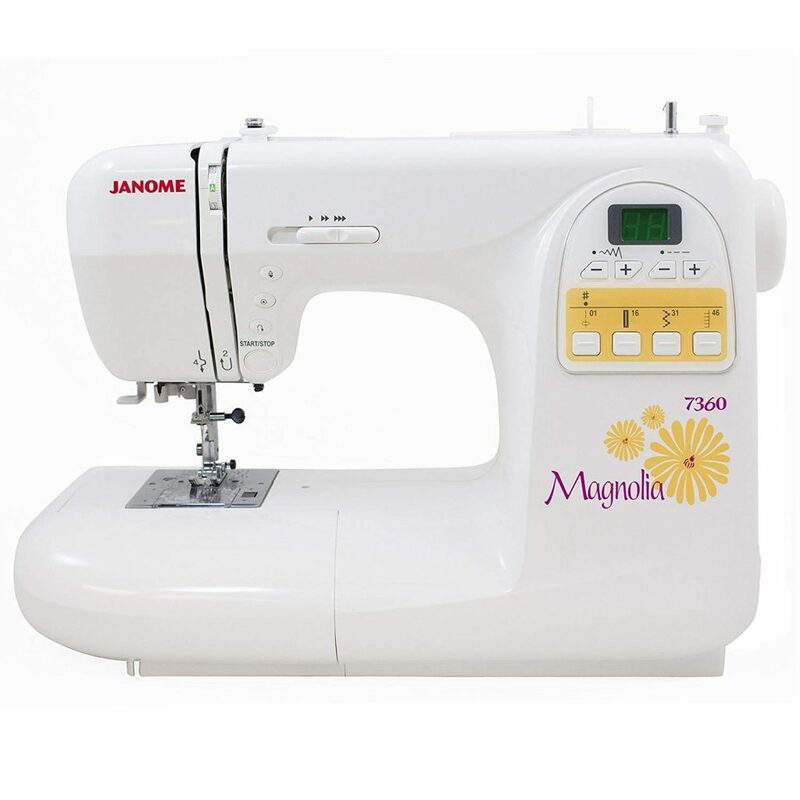 From my experience of reviewing sewing machines, I have seen that Janome machines are generally better built for durability. They use metal wherever possible, rather than using cheap plastic to cut costs. Which is why Janome machines are always expensive especially when you compare the features. As I have said earlier, Janome 7360 is targeted at quilters, so Janome has included a bonus accessory package worth $118 (according to Janome, not me) with this machine. The package includes Walking Foot and a 1/4″ foot. I think the $118 worth is just a marketing gimmick, not a big deal. Janome 7360 is a workhorse. The machine has an incredible ability to perform admirably on different types of fabrics. It works well on lightweight fabrics and works even better on multiple layers of denim (6 plus layers and no problem at all). You can feel the quality from the first stitch itself. It has best stitch quality among the sewing machines I have reviewed in the recent past. You have a lot of stitches to choose from as well. I really like the built quality of this machine. If looked after well, it will serve you long for sure. You can’t say that the motor is a beast. On paper, Janome 7360′s motor can deliver 820 stitches/minute. In this class, you normally expect at least 850 spm. But the interesting thing is that, it never felt under powered, in fact it worked flawlessly. Being projected as a machine for quilters, Janome missed the trick as they didn’t include an extension table. At this point, I really can’t find any reason to not to buy Janome 7360. It sews like a dream, at least that is what you expect from a sewing machine. It may not have 200 built-in stitches or something, but the quality is for everyone to see. Some might consider it as expensive, but I think it is really worth the money.